We have heavy-duty rubber pipe flashing boots for every application and roof type, all from the best manufacturers including Aztec / Master Flash, Deck-Mate and Deks / Deck Tites. 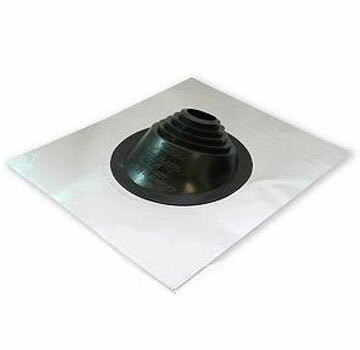 We also have every type of Retrofit Flashing Boot Rubber roof-pipe flashings are designed to seal round penetrations and can be use in all types of roofs or walls. The are engineered to accommodate the extreme movement in pipes due to temperature and weather, while maintaining a watertight seal. 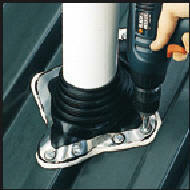 The materials for rubber flashing boots are engineered to provide very long-term performance. They also provide electrical insulation (important in lightning storms). 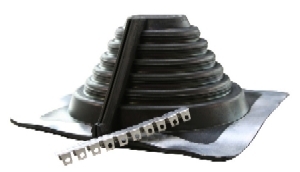 The Mini and Mini-2 and Mini-3 styles are used for smaller penetrations such as wires, conduit, insulators, solar mounts, and waterproofing for antennas and lighting rods. 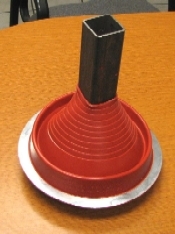 We also have metal pipe flashings (pipe jacks). 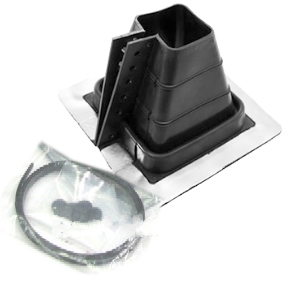 We inventory all sizes of Black EPDM rubber and high temp Silicone rubber pipe flashing boots. These handle 1/8" antennas up to 26 inch stove and chemical pipes. Materials properties are HERE. We have a full selection of RETROFIT (wrap-around) pipe flashings and Multi-Flash combo flashings. And also Retro-Spins, roof jack retrofits for electrical conduit entry. Also flashings for solar panel mounts. For irregular or multiple penetrations in one area, see our roof penetrations page for additional options. You'll find a solution there. Residential Roof Flashings: Items for asphalt/shingle or tile roofs. Silicone: For extreme temperatures, corrosion & life. Square Base: Larger base / seal area; HD design; fits standing seam roofs. New: 35 Year ICC listed Boots. 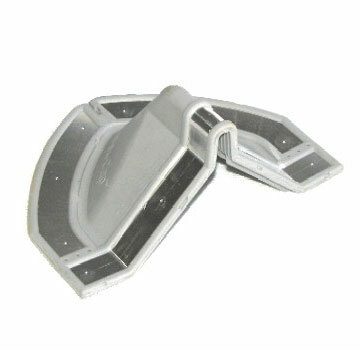 Square Shaped Penetrations: Boots for square tubing, beams, etc. Installation Instructions for pipe flashing boots. Installation Instructions for retrofit boots. These are the thickest, most HD boots, with a large foot for large standing seams. (click on Part# below to get pricing and details). Now Available: 35 Year / ICC Boots, 35 year / ICC Specification. New: Black Silicone Rubber flashings - newest designs at great prices. Selection: Check the outside diameter of pipe. Click on the appropriate Part# for your pipe diameter. 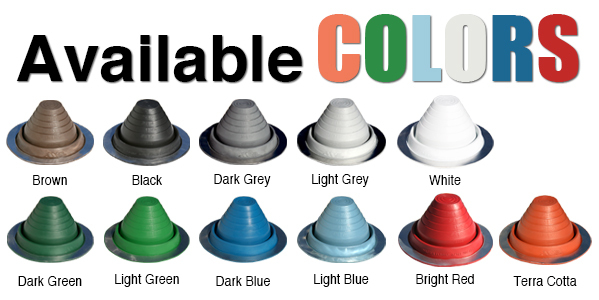 For high pitch or great surface irregularity, select the largest size which fits your pipe. Colors are now available in all sizes of square based flashings. DeckMates are similar to square-base flashings above, but use a stainless steel clamp at the top (included). Selection: Check the outside diameter of pipe. Click on the appropriate Part# for your pipe diameter. For high pitch or surface irregularity, select the largest size which fits your pipe. .
* DECK-MATE BOOTS ARE SIZED TO THE NOMINAL PIPE SIZE, NOT DIAMETER. 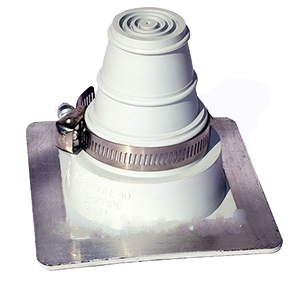 Lower Cost, Round Base Flashings. Also in colors. Selection: Check the outside diameter of pipe. Click on the appropriate Part# for your pipe diameter. For high pitch or surface irregularity, select the largest size which fits your pipe. NEW: AC & CONDUIT MULTI-PIPE FLASHING SYSTEMS. Seals 2 conduit pipes and one ac pipe in one convenient waterproofing system. Also Retro-Spins, roof jack retrofits for electrical conduit entry.